I found this at an antique mall before Christmas and kept forgetting to post it. It's printed on really thick cardboard stock, so I hope it's the genuine article. Measures 10 1/2 by 15 1/2". Even with the staining I thought it was worth risking $28 on it. The pic's at an odd angle cuz I was trying to minimize the flash. I really like the bold colors. Not a bad risk at all for $28. I would have purchased it if I came across it. I recently came across your post here in this forum and I think I might have accidentally found something that you may find VERY interesting. 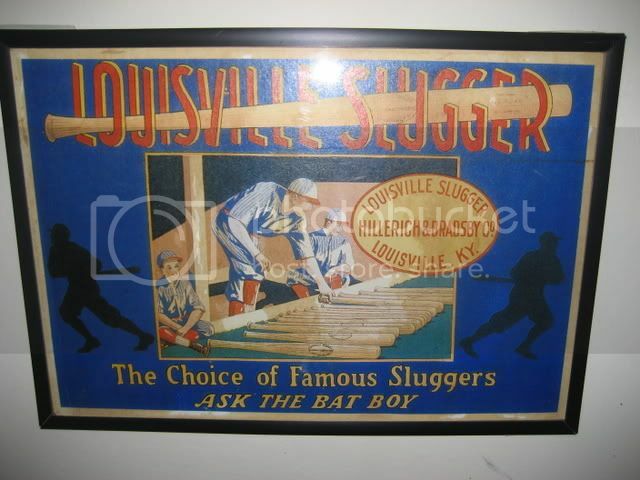 You might have already figured this out by now, but your Lousiville Slugger sign may be worth a lot of money. I found these sites related to your $28 Louisville Slugger sign. If your sign is authentic and not a reproduction, you may have found a real treasure! Congrats! Below are the links I found as I was searching for cool pictures to post on my Pinterest page. Enjoy! Thanks for the heads up, Tony. You must've done some digging to find this post. I still have the sign and have always leaned towards it being a repro, but who knows? I will have to check into it one of these days and see if somebody can give me a definitive answer. Great avatar you have there; Ken-Wel's Dazzy Vance model is one of my all time favorite gloves. Giving a shout out to Brett, Joe, JD, William, and all you other glovers. Still have my gloves, but I'm no longer adding to 'em. I think I went as far as I could go in this hobby. Thanks for the many hours of enjoyment from this website and of course from the late, great TGC. Hi ya Greg. Hope you are well. What do you mean you have gone as far as you can go? You can never get to the end (that's what I keep telling myself anyway). You have a ton of great gloves you could trade me if you want to mix it up. If you get a sec, do a search for Gleiss in the main Gallery and send me any other pics you would like uploaded or any you no longer own and I'll get them fixed. I got a on a roll recently and uploaded a ton. We are just shy of 14,000 pics now. Thanks Greg. P.S. - Working diligently to get the look and theme back of the old Glove Gallery. I hate the way this theme looks but we hit software bugs, then limitations and then server limitations. Working out the bugs one at a time. ebbets55 wrote: What do you mean you have gone as far as you can go? You can never get to the end (that's what I keep telling myself anyway). Y'know you're probably right about that. Maybe I'm just taking a break. I'll check out your Gallery and see what I need to update. Always enjoy spending time on your website anyway. How about a monster trade involving my rarer than rare LS ad piece?